A High Court judge today rejected Tower Hamlets council’s long running legal challenge to Eric Pickles’ decision to send in inspectors to the town hall. 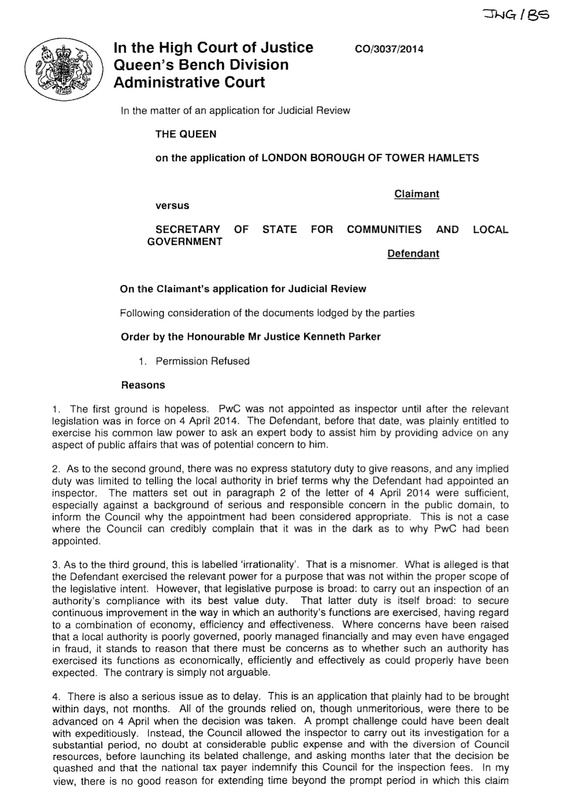 Mr Justice Goss refused the council permission to proceed to a full judicial review of the legal basis for the inspection, which culminated in PricewaterhouseCooper’s highly critical report of the town hall last week. Today was the second rejection of the council’s legal bid by a senior judge and its costs are in the region of £50,000. 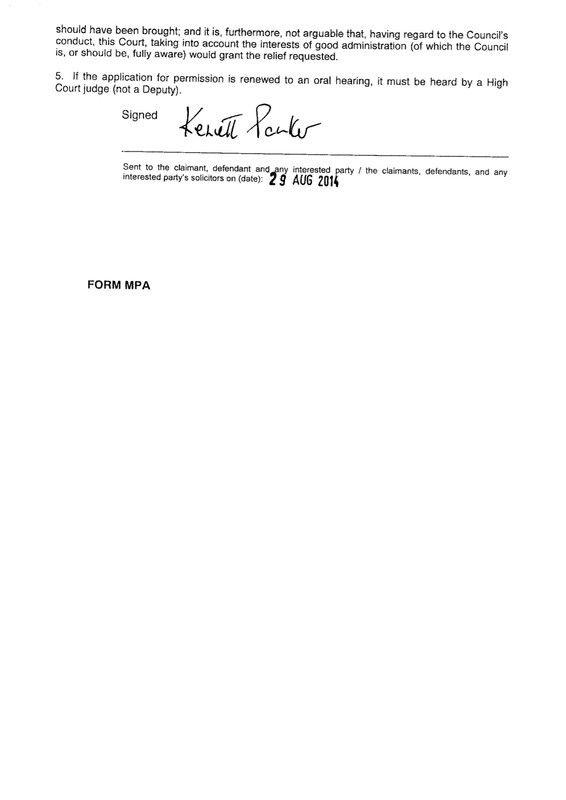 In August, Mr Justice Kenneth Parker in a written ruling (here and here) had described the application as “hopeless” and “unmeritorious”. Undeterred, the council, led by Mayor Lutfur Rahman and advised by Interim Monitoring Officer Meic Sullivan-Gould, then requested today’s oral at the Royal Courts of Justice. However, the council’s barrister, Jonathan Swift QC, lost his argument. The council’s legal costs on this case alone are at least £40,000. Today’s judge also ordered the town hall to pay DCLG’s legal costs of £8,500. When Eric Pickles announced the inspection in April, the council issued a statement “welcoming” the chance to prove it spent taxpayers’ money in a “best value” way. The council was then criticised by the Government for dragging its heels during the inspection and while it contested its legal basis. Local Government Minister Kris Hopkins said after today’s hearing: “We are pleased that the courts have thrown out Tower Hamlets’ legal challenge for a second time. “However, it is disappointing that local taxpayers are having to foot the bill for the Mayor’s legal costs. Mayor Rahman said: “Our case challenged the £1m cost of the audit and raises fundamental questions about the legal relationship between local and central government. Today, Mr Justice Goss said he could not do any better than his colleague. He read out ground three again in its entirety. The first ground (on timing) was not considered again today as it was regarded as “hopeless” first time round, and Tower Hamlets decided not to put it forward. ……and two days ago, Ken Livingstone at the Water Lily rally urged Lutfur to hire the best lawyers and challenge Eric Pickles’ proposal to send in Commissioners. Ken did not say that he would personally fund such a challenge. Funny that. It’s always easier with other people’s money.